← Lobby: Trump’s ‘America First’ slogan is antisemitic! On January 27, the Supreme Court of India rejected a petition seeking nation-wide ban on Holy Cow slaughter, a measure that would have effectively banned beef consumption in a nation of 1.25 billion. “One state may ban slaughter, the other may not,” the court said in rejecting the petition. The slaughter of cow and its progeny is banned in 20 of the 29 Indian states; the consumption of their meat is also largely prohibited even though the great majority its minorities; Dalit Hindus (220 million), Muslims (160 million), Christian (28 million), Sikh (27 million), and Animists consume beef on daily basis. Kerala, West Bengal, Nagaland, Mizoram, Meghalaya, Tripura, Arunachal Pradesh, Sikkim, and Indian occupied Jammu and Kashmir – permit slaughter of cow and serving of beef in restaurants. 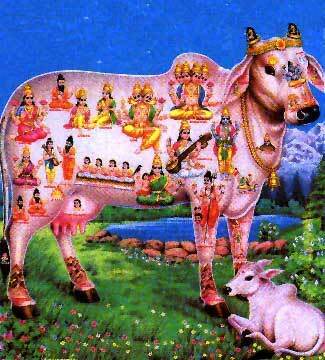 The Father of India, MK Gandhi claimed that cow is not holier than other animals. Hindu should honor and save all animals. Hindu religious scriptures such as Satapatha Brahmana confirm that Hindus did sacrify and consumed cow meat before the arrival of Muslims in the Indian sub-continent. Sanjeev Nayyar in an article, entitled, The Truth about cow slaughter in India, debunks Hindutva claim that Muslims are the evils behind disrespect to Hindu Holy Cow. His study is based on 1) book by Gandhian Dharampal’s book, The British Origin of Cow-slaughter in India, 2) if slaughter of cow is sanctioned in Islamic scriptures since willy-nilly Muslims have been cast as villains in the piece, and 3) the environmental impact of beef consumption. How ironic, despite Narendra Modi and his ruling BJP war on Muslims for consuming beef – India still ranks world’s no.1 beef exporter. Imagine how the Jewish Lobby would jump from roof – if Iran ever bans its Christian (1.5 million), and Jews (30,000) to slaughter or consume pig meat – the only animal described non-kosher in Holy Qur’an. Why would he Jewish lobby react negatively when pork consumption is prohibited in Judaism as well? Pork was prohibited in both Torah and the Gospel of Barnabas. But modern-day Jews follow Talmud while Christians follow 4-Gospels authored by people over 100-180 years after the disappearance of prophet Jesus (as). Both Jews and Christians consume Pork in the West. According to PEW 2015 survey, 57% of US Jews consume Pork. St. Paul, the founder of modern Christianity allowed Christians to consume Pork. No question that the Christians eat pork, that was not an issue. But the fact that many Jews in the West eat ham to their heart’s content does not mean that Judaism allows it or that they would eat it in the presence of their rabbis. “I was in China with President Xi and they said: We want to have your dairy industry. They drink a lot of milk in China. And I said: Well, that’s a very good choice because you know which cow produces more milk per cow than any other cow? You think it’s a Dutch cow or French cow? No, it’s a Jewish cow. It’s a computerized cow. Every moo is computerized,” Netanyahu boasted in June 2015.